First off, we want to make it clear that we do not handle stray dog problems. We deal with wildlife only. This page just offers some advice. Ultimately, you probably want to call your local county animal services, city animal control, SPCA, or local humane society regarding any dog issues. How to Get Rid of Stray Dogs in the Neighborhood - Legally the only people able to take the stray population into their own hands are the police and the ASPCA. Homeowners who have come across a stray dog may take it in but are obligated to call the authorities on the off chance it may be someone’s pet. Getting rid of stray dogs in the neighborhood is not a task for just one property owner. The neighborhood needs to make a collective effort to clean up the items that lure dogs in the first place. Garbage bags and cans are one of the primary food sources for stray dogs. By keeping cans secured or in the garage until the garbage men come will keep dogs away from the edible contents. Pet food is also another huge draw for strays. Cat or dog food left out will draw in feral dogs, cats and other animals. Compost, dumpsters and litter from fast food places will keep the dog population investigating your area. These issues can only be resolved by a community effort. You can keep strays out of your yard with these methods but you cannot clean up a neighborhood by yourself. How to Get Rid of Stray Dogs - Stray dogs, otherwise called feral dogs, are an unfortunately common sight in almost every part of the world. There are many different reasons for why a dog becomes a stray; either it was born on as a stray because stray dogs are rarely fixed and just produce a bigger problem, or the dog once lived in a home and now does not. Many people find that taking care of a dog was too much for them to handle or they could not afford it anymore so they dump it far from their house. This happens to all kinds of dogs, no matter what gender it is or what breed or temperament it has. Most people do not do the responsible thing and take it to a shelter, so many cities and rural towns have problems with stray dogs. Stray dogs can become a big nuisance to you, your children and your pets. Stray dogs are hungry and will be attracted to your house and make a mess out of your garbage cans and garden begs. Stray dogs can dig holes in your yard, in your garden and make a den to have pups under your house. They can also relieve themselves on your lawn which will damage the grass and cause your dog to become confused. When your pet detects strange scents they can dig holes in your lawn and be distracted when you just want them to go to the bathroom so you can get back inside. Many stray dogs are sick, have parasites or even rabies which can make them attack you, your children or your pets. If you see a stray dog hanging around your neighborhood, try some of these tricks to get rid of them. To prevent a stray dog from taking interest in your house, make sure that all of the food is secured. Secure your garbage cans in air tight containers, keep your pet’s food inside and clean up any fruit, vegetables or berries that have fallen to the ground. Also, build a fence around your vegetable garden to make it harder for them to get to the food. If you take away their food sources, they are likely not to come near your house. Pick up your pet’s waste. Dogs communicate with scents and sounds and if you leave their droppings in the yard a stray dog will be curious as to what that smell is. This can be a really big problem if your dog or the stray dog is in heat because it will be nearly impossible to keep the dog away if that is the case. If the stray dog seems to be friendly and comes up to you immediately, the chances are that it is lost or was just separated from its family. If this is the case you can coax it into your car with a yummy snack and take it to the shelter. Stray dogs are becoming a big problem in many areas of the country. Strays are usually nomadic, forming packs when their numbers allow and raiding garbage cans in an attempt to locate food. Keeping a stray dog out of your garbage will require a sturdy can with a secured lid. Dogs are large enough to knock cans over so be sure the lid is tight and latched with bungee cords or some kind of rope. It is important to know that you cannot legally trap or shoot a stray dog. There is no way to identify a stray animal from a lost one. Most towns and cities have special law enforcement agents dedicated to the capture and relocation of stray dogs. Feral canines can also be very aggressive and may harbor disease. If a stray is lingering around your home do not approach it. Call the dog control officer and wait for assistance. Stray dogs are not always on the hunt for food though that is one of the main reasons they remain nomadic scavengers. Some stray dogs are legitimately looking for a place to stay where it is safe and food comes easily. Places where stray animals are fed or where pet food is allowed to sit out overnight are good places for a stray canine to think about calling “home”. A stray dog in the back yard will want to stay if you offer it food. Do not feed the stray unless you intend to keep it around until the authorities arrive. If you want the animal to move on, ignore it. As long as your garbage is secured and unreachable and no pet food or compost is lying around, the dog should eventually leave in search of richer stomping grounds. It is not a bad idea to offer food to a stray dog if you have called the dog control officer to come and get it. The animal will probably appreciate the meal and may be distracted enough to ignore the officer when he or she comes to take it to the shelter. A stray dog may decide to live under the deck of your house if the space is large enough and the ground underneath dry enough. Decks offer adequate protection from the weather and will hide a dog well enough so it does not get harassed by humans or other animals. If you’ve noticed a stray dog under your deck, be very careful anytime you exit the house. Stray dogs are not all cute and starved for affection. Some of these animals are vicious and disease-ridden. If you’re attacked by a stray dog you will need immediate medical attention and may even be killed. The dog may seem friendly but do not take the chance. Call the dog control officer and have a professional come out to remove the animal. If you can do so safely, you can feed the stray only when you know assistance is on the way. Animals that are not hungry are often less wary and aggressive than those who are in desperate need of a meal. Feeding also helps establish trust, something stray dogs need to learn if they are to be rehabilitated and adopted out. 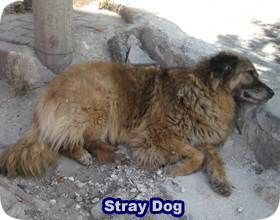 Go back to the main Stray Dog Removal page for more information about how to get rid of stray dog.